Dictation has become a popular method for laying down a first draft. Barbara Cartland and Voltaire did it, James Patterson and Dan Brown are doing it, and popular self-publishing author Joanna Penn is determined to try it. 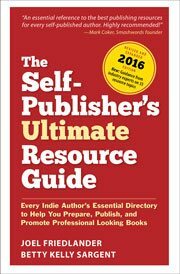 In fact, Cindy Grigg (The Productive Author’s Guide to Dictation) and Monica Leonelle (Dictate Your Book) have written books on the subject so you can try it, too. It eases the strain on your wrists. You can get words down faster than with typing. It can separate writing from editing, which can do wonders for procrastination and writer’s block. It gets you away from your desk, and out for a walk if you have a dictation set-up to support that. It’s not hard, and it doesn’t have to cost you a cent. Not convinced? That’s okay. I’ve been there, and on some days I am there. If you change your mind and give dictation a try, come back to this post to figure out what to do with that dictated first draft. I’ll admit it. I’ve come to the idea of dictation with a lot of skepticism. I’ve learned to think and write through my fingers, first with a pen, then with a keyboard. Could I learn to use talking as a vehicle for thinking? I remember the awkwardness I felt when I was first learning how to type. I survived those first fumbling attempts, and my typing-to-thinking pathway is now firmly established. Fast forward several gazillion words and 11 books later. My brain seems to be holding up, but my wrists, sadly, are not. It’s time to build another writing pathway. It’s not difficult to get words onto a page with dictation. What’s difficult is figuring out which ones to keep. Or how to manage that sea of words. If you’ve tried dictation, you may discover that your first draft reads differently than a typed first draft. It may be looser, less organized, and wordy. As a result, your approach to editing may need to be different. Or you may find that you’ll need to spend more time at the editing stage of the writing process. A lot more. Monica Leonelle recommends creating an outline before you begin dictation. Similarly, though she doesn’t use dictation to increase writing productivity, in 2k to 10k Rachel Aaron recommends taking five minutes to sketch out notes for each scene in a notebook before you write it. This is excellent advice. Because words can come so quickly when you’re dictating, it’s possible to create volumes of text that go off topic or off plot. Having an outline or notes to speak by can help you stay on task and prevent plot holes. You can, of course, dictate an outline or scene notes, but it’s okay to use a pen or a keyboard to outline your writing, too. Most dictation software is now 95–98 percent accurate. Off the top, you can count on fixing two to five words in every hundred you speak. What words will you have to fix? Those that your dictation software didn’t understand. Depending on your spoken dialect and your skill as a typist, this may or may not be equal to the number of typos you make in every hundred words. Keep in mind, though, that dictation software can make creative (and sometimes hilarious) “typos” that you may not be able to decipher later. Be sure to read over your words often to correct any errors while what you intended to say is fresh in your mind. Your mother was right: think before you speak. Monica Leonelle recommends pausing to gather your thoughts before you speak a sentence. This is the single best piece of advice when learning to dictate your writing. There’s no need to hurry. Hurrying can encourage muddled thinking, which can result in bloated and disorganized writing. Bloated writing requires more attention at the editing stage, which is fine if you’ve budgeted lots of time for editing. Lots. Once you’ve completed your first-draft dictation, you’ll need a plan for revising and editing it. As with typewritten text, it’s best to approach revisions and edits in layers. Go through the four levels of editing, beginning with a big-picture edit and ending with word-level details. your writing has an overall flow. your plot lines are well-paced. scenes or sections are evenly weighted. paragraphs are shortened if you forgot to instruct the dictation software to create a new paragraph (ahem). paragraphs and sentences proceed in a logical way (especially if you had trouble sticking to your outline). sentences are trimmed of wordiness. your sentences are correctly punctuated (you need to speak out punctuation, and this takes getting used to). I’ve noticed that my current abilities with dictation cause me to produce 40-word sentences. Twenty-word sentences are better for comprehension. I need more than the usual work at the paragraph level. You may find that, too. If you’ve gotten off track with the structure of your book, consider using Scrivener to help you analyze and reorganize your writing. Scrivener’s Binder and Split Screen can help you to rearrange sections of your book. 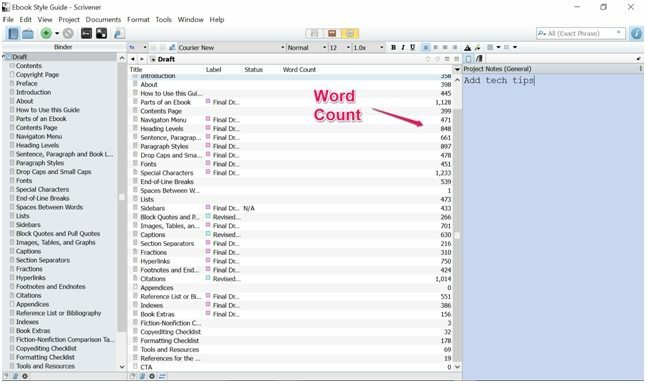 The Word Count column in the Outliner can help you discover potential pacing problems at a glance. Labels will allow you to visually separate plot lines to see if they flow and intersect where they need to. A spoken first draft can be different from a written first draft. You may use filler words, such as “really,” “just,” and “even” in dictation — words that are often used in spoken language for emphasis. These words work fine in spoken language, but depending on what you’re writing, filler words can muddy the meaning of a sentence. The NeedlessWords macro can help you spot filler words so you can remove them. The Overused Words check in ProWriting Aid will help you see where you need to add variety to your writing. Your sentences may be longer and more complex when you dictate your writing. That’s okay when you’re speaking, because your intonation can help listeners group words into meaningful chunks. There’s no intonation in writing, so be sure to shorten sentences or punctuate them so that they’re easier for readers to navigate. The long sentence highlighter in the Hemingway Editor can help you shorten long sentences. So can the Sticky Sentences check and the Long Sentences check in ProWriting Aid. Sometimes it’s okay to strut your vocabulary. In some kinds of nonfiction, it’s more important to remove every possible barrier to understanding — including ten-dollar words. To help you choose simpler words and improve readability, use the Hemingway Editor, the PlainLanguage macro, Paul Beverley’s Find and Replace macro with a supporting plain language words list, or the Diction check in ProWriting Aid. Did I dictate this article? Some of it. And that’s my final tip: you don’t have to use dictation exclusively — especially when you’re learning this new skill. If you’re a visual learner whose thinking is guided by the words you see or a kinesthetic learner who works out your thoughts by penning or keyboarding them, it might not make sense to dictate all your writing. (Hat tip to Russell Blake for this observation in an interview with Joanna Penn.) Besides, Rachel Aaron, who has written over 20 books, has proven that it’s possible to be productive without voice dictation. Don’t be afraid to dictate part of an article or book, or begin with dictating text and email messages. If you build your capacity for dictation slowly, you’ll be less likely to abandon it and more likely to find a place for it in your writing process. Instead of an all-or-nothing proposition, think of dictation as one of many tools in your writing toolkit. Editor’s note from Carla Douglas: Corina and I have been editing each other’s writing for 14 years. After a first read-through of this piece, I noticed that something was different. Was it voice? Tone? Organization? Yes to all of these and more, and I wondered what was up. This didn’t sound like Corina — it was looser and less precise than what I’ve come to expect. Then it dawned on me: she’d been dictating! This is a topic I find fascinating, and recent research supports my hunch that “written and spoken language can exist separately in the brain.” This doesn’t mean that dication isn’t a drafting method worth exploring. I’m curious to learn whether a dictated first draft is much different from one that’s been brain-dumped into a word processor. Hi, I interview people for a living. And my wrists are about to fall off from transcribing. Can dictation work for this? I have to go to their houses. What if they don’t have internet? Any suggestions would be greatly appreciated! Thank you so much. I do exclusively dictate my first drafts, and I have to say, some of the errors are magnificent. Phonetically though, I’ve only come across 1, in my current 70k manuscript, where I couldn’t figure out what I meant to say. And since my edits can be so comprehensive, I honestly don’t even stress making changes while I’m dictating. I tried that, but then the urge to edit became strong, and since it hasn’t impacted my ability to read what I intended, I let it go. I always say that I don’t believe dictating makes more errors than typing. The difference is that we tend to correct errors immediately (if you’re like me and hate the red line), so we don’t think about error rate as much. When dictating, or transcribing, which I do a lot, you see them all at once and it looks higher than it would be if you’d typed and corrected as you went along. Jayce: You make an excellent point. I think I need to give it “another go” for first drafts! Maybe it’s just how I speak, but I find that I have to make so many corrections that dictating what goes into books isn’t worth the trouble. What is worth the trouble are dictating ideas that come to me on walks or in the middle of the night. I’ve got a handy app for my iPhone call MeMail that lets me send email to myself quickly. It allows dictation, so that saves me a lot of typing on a small screen and it doesn’t matter if the result is not perfect. Having those ideas come in as email means I’m less likely to forget them. Michael: Thanks so much for mentioning the MeMail app. I just purchased it for my iPhone. I dictate on my iPhone straight into Evernote using the microphone on the keyboard. Then I keep everything organized in there. I have learned to speak more clearly and enunciate with Dragon so that it understands me properly. A good thing for everyone, to be sure. Hi. Do you need Dragon if you use Evernote? Reread what she wrote. She meant that by using Dragon (in the past), she has learned to enunciate words properly; not that she needs Dragon while using Evernote. Great post! I used Nuance’s product, Dragon Naturally Speaking, for years when I had a PC, and it worked magnificently. I was even able to teach the English version how to recognize words in Castilian. I loved it. But since purchasing my iMac three years ago, I’ve been so frustrated with Dragon. The Mac version doesn’t have the same features. Well, in theory, it does but in practice it doesn’t. I think what I need to do is focus on using Google’s dictation program. Have you heard about dictation programs that work best for an iMac? BTW: I love Grammarly as a revision/proofreading program. I use in on the Mac with little problems, and I use a lot of Japanese names and words. I’ve “taught” Dragon most of them and it has learned them to the point where I can dictate without being stalled by foreign words. I’ve been dictating on and off for the past couple of months, and it’s really improved my life in so many ways. I do what Monica suggests (and what I had already been doing before I tried dictations), to write out beats for each chapter before I draft it. I walk on my treadmill and dictate at the same time, so it’s been good for my hands and my whole body health. I really wanted to keep my writing style the same between dictating and typing so it took a long time to learn to say what I wanted to type, instead of just doing a free-form talk it all out draft. But with practice, it’s almost the same. I usually the get the bones of a scene or chapter down with dictation (1500-2000 words) and then sit down, edit out all the weird words Dragon decided to use (like “psy” instead of “sigh”?? ), and add in some extra descriptions. All in all, it’s been very helpful. One note: the article does say that “it doesn’t have to cost a penny” but really, if you plan to do any real dictation, you should probably buy Dragon. It’s worth it. The built in dictation on Mac and iPhone is okay, but it doesn’t learn from you. It’s mediocre at best. Thanks for your thoughts, S.J. So you’d say that Dragon is worth the investment for you. One of the many cool things about Dragon are all the different dialects it can be changed to. It even has one for teens! So if you don’t hit on the right one initially, it’s worth looking to see if you would be better off with a different dialect. Karl, as a writer who has used Dragon in the past, I highly recommend you give it another try. The latest versions of Dragon now have an out-of-the-box accuracy of over 95%. I’ve used 3 older versions of Dragon, which required weeks of training. The latest version requires significantly less. Also, you have the option of carrying over your profile from an old computer when you upgrade. So the problems you encountered in the past are no longer an issue. This is first time I’m very excited about using Dragon for dictating, the accuracy is that much better than in the past. Good luck!! Thanks Ansha, I’ll consider giving it another go! I wonder if some dialects of spoken English require more preparatory work with speech recognition software than others. See my response to S.J above. It’s hard to know how long to persist with something, isn’t it? Copying my reply from above! For me, editing is an intrinsic part of writing. I never separate writing from editing, and even combine them with page formatting. I write books, not just words. The idea of separating writing from editing comes from one of my favourite books: Writing Down the Bones: Freeing the Writer Within by Natalie Goldberg. Goldberg recommends separating the editing process (the “inner critic”) from the drafting process (the “wild mind”), especially if you’re blocked, or if you’re having problems starting.